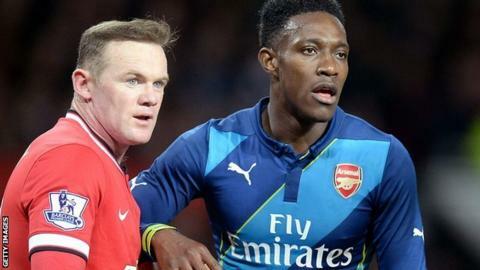 Arsenal striker Danny Welbeck has ignored criticism of his goalscoring record by his former Manchester United boss Louis van Gaal. Welbeck, 24, left United in September with 29 goals in 142 games and Van Gaal said he could not match the "standard" of Wayne Rooney and Robin van Persie. "Everyone is entitled to their opinion - some you like, some you don't," Welbeck told BBC Football Focus. "It's football, it's life. You deal with it." Welbeck has scored eight goals in 32 matches for the Gunners this season and struck the winner as the FA Cup holders eliminated his former club from this year's competition. But his ratio of less than a goal every four games at United led to his £16m move to Arsenal according to Van Gaal, who signed Radamel Falcao on loan to join Rooney and Van Persie. "You've got to be strong mentally living the life of being a professional footballer - there's a lot of people out to get you," added Welbeck, who is currently top scorer in European Championship qualifying. "Everyone is watching. You just have to be switched on all the time." Welbeck has never managed to hit 10 league goals in a season since making his Premier League debut in 2008 and his record of four in the top flight this term is far from prolific. In contrast, Rooney has managed a minimum 11 league goals in each of his seasons since joining the Red Devils in 2004 and Van Persie has managed double figures in every one of his three campaigns at Old Trafford. "It's a transitional year for me and getting to know new players, team-mates, systems, new ways of going about things," Welbeck told ex-Arsenal defender Martin Keown for Football Focus. "I think I've put in a few good performances and been a bit unlucky on the goals front, which is something I know will come in abundance once I come to know everything spot on with the club." Under former Manchester United boss David Moyes and during tournament football with England, Welbeck has often been asked to occupy a wide role. When the striker moved to the Emirates, Gunners boss Arsene Wenger initially used the former Sunderland and Preston loanee centrally but has tweaked his role to accommodate Olivier Giroud. Despite the adjustment, Welbeck has featured in Arsenal's last seven league games - all wins - during which time they have gone second, seven points behind Chelsea. "It's no secret I prefer to play down the middle but the formation we play at Arsenal, you play on left or right but always inter-changing in a three-man attack - it's much easier doing that than playing left wing in a four-man midfield," added Welbeck. Wayne Rooney (5) and Radamel Falcao (4) have more assists than Welbeck's three in the league while Van Persie has two. After acquiring Welbeck, Wenger admitted he "did not know he was so quick", adding his signing was "electric." Welbeck used his pace to pounce on a mistake and knock Van Gaal's side out of the FA Cup to seal Arsenal's semi-final place against Reading on Saturday. "It was a weird occasion for me, going back to Old Trafford on the away side," he added. "The weirdest thing was warming up on the other side of the pitch. "I just wanted to play the game, get it over and done with and get through to Wembley. I scored the goal and whatever I did would have been criticised. It was just spur of the moment."